In the old Residenz in Munich, which my wife and I recently visited, there is a beautiful collection of portraits, the AHNENGALERIE, showing over 100 distinguished members of the house of Wittelsbach. This Versailles-inspired room is in gold and white which, together with the portraits, creates for an astounding atmosphere and a rare display of beauty. Each portrait has a gilded crowned frame, where you will find the name, title and dates of birth and death of the portrayed. This breath-taking gallery takes you through a dynastic mix of dukes and electorates, kings and queens and emperors and empresses. Aware of the fact that three kings and one queen of Sweden, Carl X Gustav, Carl XI, Carl XII and Ulrika Eleonora, were members of the house of Pfalz-Zweibrücken, a branch of the Wittelsbachs, I of course start to look for them. And there he was, Carolus Rex, the Swedish warrior king Carl XII. But what is this? Close to him is this man: Carl XI, King of Sweden. Yes, that is what it says. 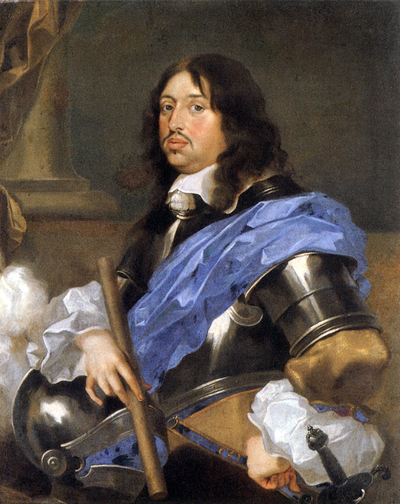 But like all historically interested Swedes, I know that this is NOT Carl XI, but his father, Carl X Gustaf, who in 1654 succeeded his cousin, Queen Christina, when the latter abdicated in order to convert to Catholicism. The real Carl XI is identified as someone else, and God knows who the man is that is called Carl X Gustaf. Turns out there are major identification mistakes here and there in the collection. Being a notorious know-it-all, it is of course impossible to refrain from pointing out these mistakes to the staff. The female guard at first tries to dismiss and trivialize our claims over the confusion amongst the portraits. Once realizing that we actually come from Sweden - Silvia’s country - and possibly know what we are talking about, she calls for reinforcement. Within minutes, Herr Doctor So-und-So comes hurrying through the gallery, hears our story, turns pale, and exclaims: Wirklich ??? After having written down our observations in a kind of a logbook we are thanked with a VIP treatment for the remainder of our visit. 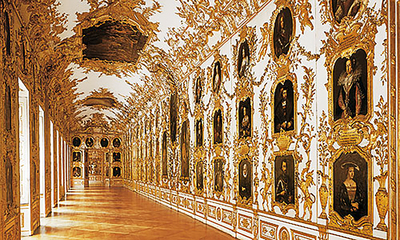 It seems, during the last part of World War II, all the portraits were removed from the Residenz so as to escape the bombardment that was to follow. When, after the war, the Residenz was restored and the pictures brought back, they came without nametags. And so, the curator did his best to match the pictures to the frames. Evidently in some cases his best was not good enough. Hence, the room today could be described as a somewhat fallible gallery.